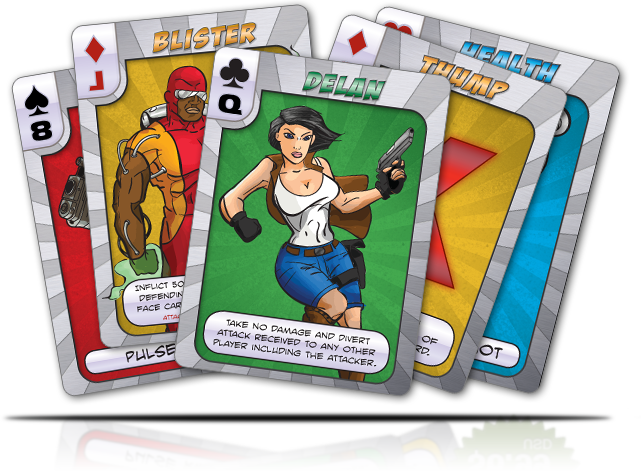 PowerMage 54™ is a stand-alone card game where players use superheroes (known as powermages) to defeat their opponents. Through the strategic use of attack items to decrease points, defense items to block , health items to increase points, powermages’ abilities, and the unique specialty “thump” cards, players slug it out to determine who is the last powermage standing. Designed, illustrated and produced by Corey L. Kliewer, PowerMage 54™ offers easy and intuitive game play that allows complex strategies. After playing just one game of PowerMage 54 players will want to play again and again. And not only can players play the addictive PowerMage 54™ rules – but since the cards are based on a standard deck of cards – any traditional card game may be played, including solitaire, gin rummy and poker, to name a few.